Wadi in Paran River, Negev, Israel. The Negev Desert is located in modern day Israel, expanding nearly 4700 square miles in the small country. The broad expanse of desert is a vitally important part of the Israeli landscape, stretching over approximately 60 percent of the country's landmass, while occupying nearly half of Palestine west of the Jordan River. The Negev's borders are somewhat ambiguous, though generally recognized as being bounded by the Jordan Rift Valley on the east, the Sinai Peninsula on the west, the coastal plain in the northwest and the Judaean Hills and Wilderness of Judaea in the north and northeast, respectively. The triangular-shaped desert's apex is on the south. Rocky exposures, Paran River, Negev, Israel. Rock face in the Negev Desert near Beersheba on the way to Eilat. 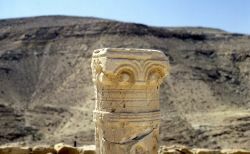 Ruins in the Negev desert. 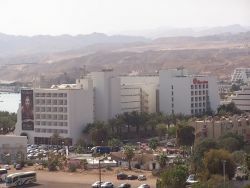 View of the Negev from the resort city, Eilat. Acacia tree in Makhtesh Gadol, Israel. View in Timna Park, Negev, Israel. The Negev also played a role in the religious development of the area, as both the Christian faiths and Judaism assert that the Negev Desert was the site where Abraham, Isaac, and Jacob tended their herds. According to the source, the name of the Negev Desert derives from either the Hebrew word for "dry" or "south" . While the origin of the name is contentious, both possible definitions seem plausible. The Negev Desert is roughly triangular in shape, with the city of Beer Sheva at its northern tip and the resort town of Eilat at the southern end. The landscape of the desert is distinguished by a large amount of erosion landforms, most notably canyons and deep valleys. 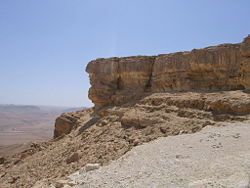 An important and prominent geographic feature of the Negev is the deep cut in the landscape called Zin. Most of the deep canyons in the Negev Valley drain towards the Syro-African Rift Valley, the lowest place on earth. The broad and sandy expanse of land that is the Negev Desert is classified as an arid and semi-arid climate, depending on the exact location within the desert. It receives very little rainfall. The variance in classification occurs as a result of the variance within the desert itself. There are five different ecological regions within the desert: Northern, Western and Central Negev, the High Plateau and the Arava Valley. The ecological zones vary in regards to rainfall, with the Northern Negev receiving the most annual precipitation at 300 mm and the Arava Valley receiving the least amount of rain a year at 100mm. The ecosystems also differ in regards to terrain and landscape, with some like the Western Negev boasting the sand dunes that are the traditional image of deserts. Another important ecosystem, High Plateau, is noted for its singular plateaus that can reach up to 520 meters above sea level. Northern Negev is often called the "Mediterranean Zone," receiving an average of 12 inches of rain annually and having fairly fertile soils. Western Negev receives an average of ten inches of rain per year and has light and partially sandy soils. Sand dunes in this region can reach heights of up to 90 feet. Central Negev has an annual precipitation of eight inches and is characterized by impervious soil. Minimum water penetration occurs resulting in greater soil erosion and water runoff. High Plateau in Ramat Hanegev at a height of 1,200 to 1,800 feet above sea level, has extreme temperatures in both summer and winter. The partially salty soils are inferior, receiving only four inches of rain per year. Arava Valley is very arid with barely two inches of rain annually. This area along the Jordanian border has poor soils unable to grow without irrigation and special soil additives. Overall, the soil of the Negev desert is rocky and not conducive to agriculture. The landscape is also frequently interrupted by rocky and sandy mountains that rise unexpectedly out of the flat terrain. In an interesting archaeological development, recent research has revealed marine shells in the sands of the Negev. Archaeologists are currently using the fossils to support the idea that the Negev was once part of the sea floor. Using this theory, the surface of the Negev Desert only became visible as the sea receded. Three kibbutzim settlements sprang up in the Negev in 1943. These were the first agricultural developments in modern times. Soon after World War II large-scale irrigation projects were initiated and soon additional settlements followed. The creation of the State of Israel in 1948 made clear the necessity of developing the Negev area. Elat (or Eilat), founded in 1951, is Israel's southernmost city, a tourist resort and port located at the northern tip of the Red Sea, on the Gulf of Aqaba arm of the Indian Ocean. At the southern end of the Arava, it straddles the southern end of the geographic line demarcating Africa from Asia. 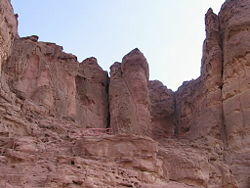 The city is adjacent to the Egyptian village of Taba, to the south, and the Jordanian port city of Aqaba, to the east. Municipality of Dimona was conceived in 1953, and settled in 1955, mostly by new immigrants from Northern Africa, who also constructed the city's houses. When the Israeli nuclear program started later that decade, a location not so far from the city was chosen for the Negev Nuclear Research Center due to its relative isolation in the desert and availability of housing. The town is home to members of the African Hebrew Israelite Nation of Jerusalem. The group, consisting largely of African or African-American people, believe they are descended from the Ten Lost Tribes of Israel. Arad, near the famous Masada, was founded in 1962. Its population reflects the broad spectrum of Israeli society. There are Ashkenazim and Sephardim, secular and religious, Bedouins and Black Hebrews, native-born Israelis and new immigrants. Israel has an extensive water project, designed in order to bring water, mainly from the Sea of Galilee, to the Negev. Irrigation is practiced, which produces crops of grain, fodder, fruits, and vegetables. Double-cropping is not uncommon. As the area was developing agriculturally, natural resource extraction also began, including bromine, copper ball clay, magnesium, natural gas, phosphate and potash. 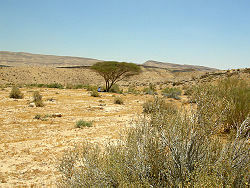 Life in the Negev Desert can be traced back over 4000 years to nomadic tribes that passed through the harsh landscape. Tribes such as the Canaanites, Amalkite, and Edomite groups were the first to settle down in the desert and complete the transition from a nomadic to a settled lifestyle. Early settlements were heavily influenced by Egypt, who gains credit in the historical annals for being the first to introduce mining and smelting to the region. The mining industry in the Negev Desert rose to become a major economic power simultaneously with the rise of the Assyrian Empire in nearby Jordan. Small settlements of Jews in the areas around the capital and later further afield were existent between 1020 and 928 B.C.E. From its humble Egyptian origins, the mining industry in the Negev soon became the major source of economic income to the area. Due to the monetary influx from the mining industry, the Negev Desert was quickly a major transit route for traders and others seeking economic gain. The new wealth into the region became crystallized in the urban centers of Oboda, Mamphis, Sobata, Elusa, and Nessana. Urban centers such as these were supported by irrigation systems imported from the Nabateans that made life in the desert bearable. The Nabateans were also prominent figures in international trade, capitalizing on the newly opened trade routes to exchange spices between Petra and Gazan ports. Along with the spice trade, the Nabateans exercised political control over the region, which was not lessened until the area fell to the Holy Roman Empire in 106 C.E. The Holy Roman Empire, however, was unable to maintain control over the Negev Desert. In the seventh century the area fell under the control of Muslim forces, who implemented Islamic rule in the region. The transition from Roman to Muslim rule was unexpectedly easy for the native population, as the area already shared a common historical heritage with the cities of Islam. Religion also helped to ease the change in leadership, due to the fact Islam had already taken root among the inhabitants of the Negev. The Arab conquest also facilitated rapid agricultural development that settled the remaining semi-nomadic tribes in the area. It must be remembered when reviewing the ancient history of the Negev Desert that much of the historical record takes the form of oral histories. When using oral histories to reconstruct historical fact it is important to note that perceptions of events are swayed by the opinions of the individual retelling the event. Oral histories play a particularly important role when reconstructing the lives of nomadic tribes. What is known of this time is largely derived from oral histories and folk tales of tribes from the Wadi Musa and Petra areas in present-day Jordan. Late in the rule of the Ottoman empire, an administrative center for southern Palestine was established in Bir es-Saba and schools and a railway station was built. The authority of the tribal chiefs over the region was recognized by the Ottomans. The Negev Desert today is a bustling landscape of different cultures and political influences. The administrative center of the area is Beer sheba, a city in the north that boasts a population of 200,000. A portion of the population are ethnic Bedouin, nomadic tribesmen that had roamed the desert prior to settlement in the area. The Bedouins have inherited the desert for more than 7,000 years, and the modern population represents a very different kind of culture than the original Bedouins. Time and modernization have had a dramatic effect on the Bedouin way of life, and the modern Bedouin population reflects cultural changes in the area. Particularly notable is the Bedouin way of life, which focuses on raising herds of sheep and goats for market. While parts of the Bedouin culture reflect modernization, the Bedouins continue to use traditional methods of husbandry, including moving the herds frequently. Another significant ethnic population in the Negev desert is the Jewish population, which numbered 379,000 at the most recent count. ↑ The Negev Foundation, Israel's Negev Desert Retrieved February 20, 2008. ↑ 2.00 2.01 2.02 2.03 2.04 2.05 2.06 2.07 2.08 2.09 2.10 Mariam Shahin, Palestine: A Guide (Interlink Books, 2005). ↑ Juan Manuel Tebes, 2007, Centro y periferia en el mundo antiguo. El Negev y sus interacciones con Egipto, Asiria, y el Levante en la Edad del Hierro (1200-586) CEHAO Monograph Series Vol. 1. Free access Retrieved February 20, 2008. ↑ Robert Schick, June 1998, "Archaeological Sources for the History of Palestine: Palestine in the Early Islamic Period: Luxuriant Legacy" in Near Eastern Archaeology volume 61, issue 2. ↑ Kurt Goering, 1979, “Israel and the Bedouin of the Negev,” in Journal of Palestine Studies 9 (1): 3-20. ↑ Israel Finkelstein, and Avi Perevolotsky, Aug., 1990, "Processes of Sedentarization and Nomadization in the History of Sinai and the Negev," in Bulletin of the American Schools of Oriental Research (279): 67-88. The Negev Foundation. Israel's Negev Desert Retrieved February 20, 2008.